With the growing importance of running workshops as part of a professional landscape photographers income many photographers, myself included, are finding less time than ever for capturing our own images. Although there is usually some opportunity to take photographs while leading a workshop, the priority absolutely has to be helping clients to capture pictures, and not yourself. With that in mind, opportunities to shoot before and after workshops are precious and rare moments for professionals, and almost essential preparation for the workshop. A couple of photo shoots before a workshop really helps to get the urge out of your system and mentally prepare you for missing opportunities later on. As with any trip you hope for some special conditions but feel the pressure even more to make the most of whatever weather is on offer in the limited time available. 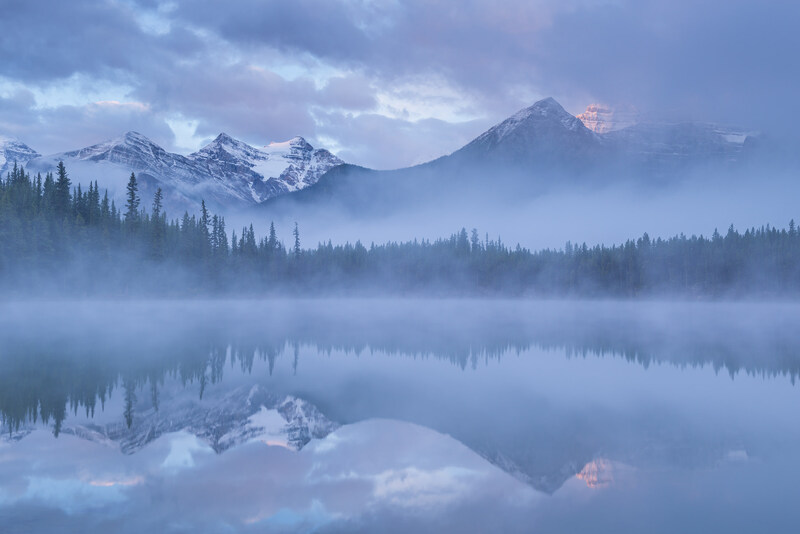 On a recent workshop in the Canadian Rockies this feeling was more intense than usual. With only one day to myself after arriving in Canada before the workshop began, I was determined to get some photography under my belt. As always before every international workshop the first day was to be spent fighting against severe jet lag while revisiting planned workshop locations, and hopefully getting a few shots in between. Unfortunately the weather had other ideas; it rained non-stop the entire day resulting in absolutely zero photographs. By the end of the day I was miserable and tired, and feeling very sorry for myself. There was just one opportunity left to capture some photographs before the workshop started, sunrise the next morning. However our time was severely restricted. We had all of 1 hour, to get to a location, shoot sunrise and then get back to the hotel before heading to the airport to meet clients. One precious hour! It didn’t seem a lot of time, but I knew of a nearby location than was only 5 minutes drive. If the weather gods were favouring us and conditions were promising we might be lucky. Dragging myself out of bed, my optimism deserted me when I realized it was raining. I had an urge to crawl back into bed, but with jet lag doing its thing I was already wide awake with little chance of going back to sleep. 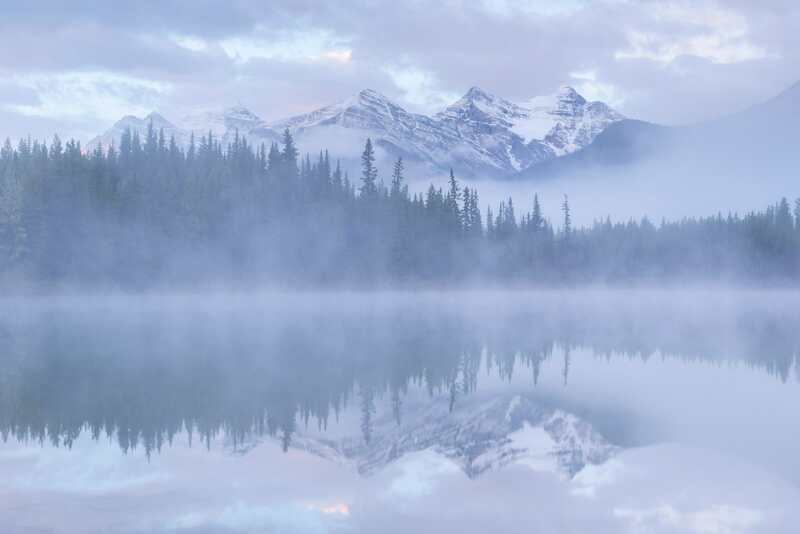 So, my colleague and I drove the 5 minute journey to reach our location, the beautiful Herbert Lake near Lake Louise. Our first view of the lake wasn’t encouraging at all; although the water was still and reflective the view was almost totally obscured by thick fog. I could barely see the trees on the far side of the small lake, let alone the mountains beyond. With just a few minutes before sunrise and less than an hour before we had to head back to the hotel it all seemed pretty hopeless, there was no way this fog would clear that quickly. Without any alternative we decided to set up anyway and try to make the most of the foggy conditions. I attached my camera onto the tripod and fired off one shot. It wasn’t a bad picture, but knowing of the marvelous scenery hidden beyond the mist left me feeling totally despondent. I was ready to give up and walk away. 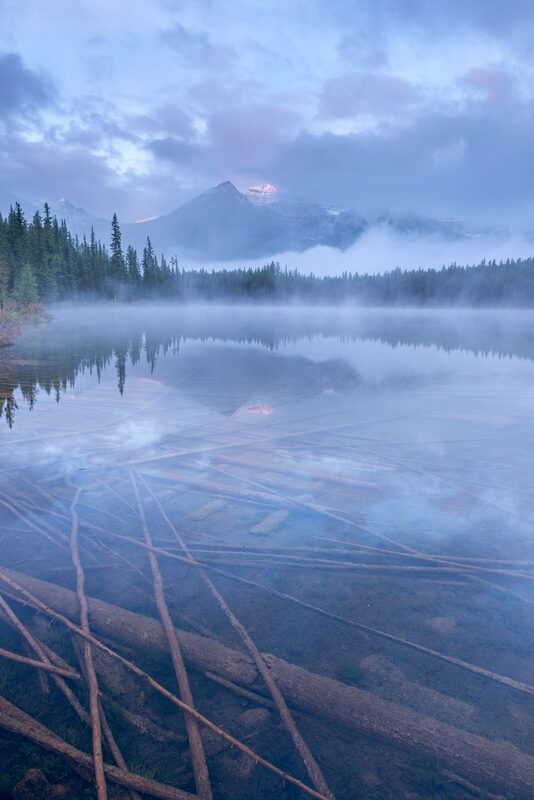 Just at that moment, the fog shifted ever so slightly to reveal the faintest outline of a mountain side across the lake. Feeling anxious but excited, I watched and waited. Within moments a little more of the mountain revealed itself through the murk. Could this be happening? Probably not! I quickly composed and fired off a couple of shots to make the most of the outline before the fog again choked the view. 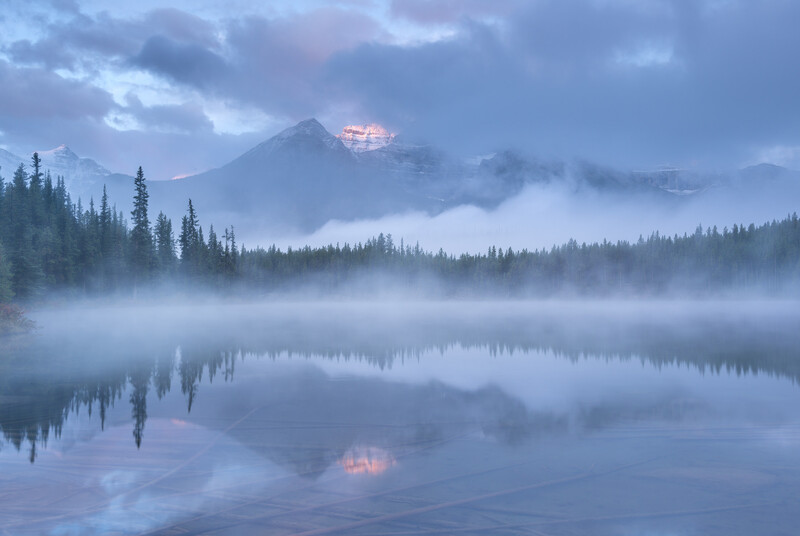 But rather than close up, within a few minutes the fog shifted more to properly reveal the majestic mountains, the highest peak accompanied by the faint but warm glow of sunlight from the rising sun. I was completely taken aback at the speed in which this scene had revealed itself and had to stop myself just gazing at the remarkable view that had appeared from nothing. With limited time, I sprang into action, dashing up and down the shoreline to photograph from a variety of viewpoints. As this was to be my only opportunity of shooting before the workshop began, I was going to make the most of it, no matter how brief! In just under an hour, I photographed the view nearly 100 times, shooting the magical scenery from up and down the shoreline in every way possible, from vertical, landscape, wide angle and telephoto. 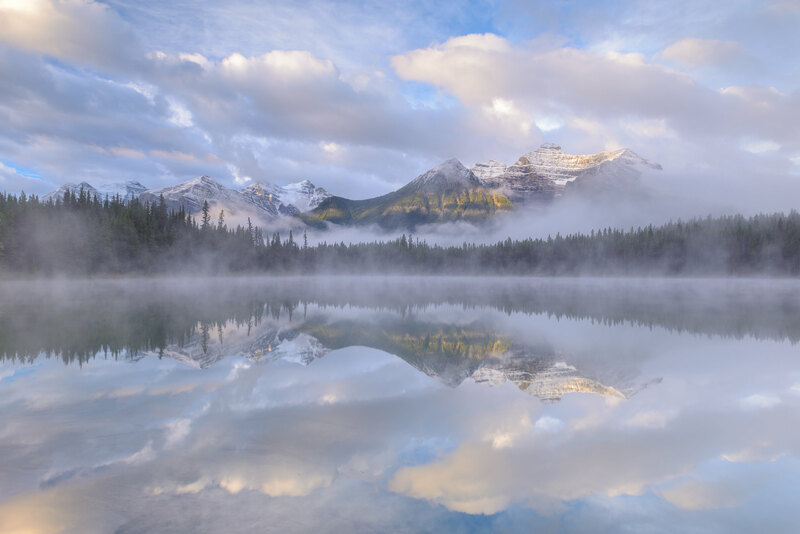 As the mist swirled the scenery constantly changed, each moment offering a different yet equally breathtaking vista. I kept shooting throughout it all, while all the time quietly marveling at both the scenery and my good fortune. All too soon our time was up and we reluctantly had to drag ourselves away from the lake, to get ready for the arrival of the workshop clients. From feeling despondent and dejected just one hour before I was now on top of the world. Only landscape photographers can understand that feeling of immense satisfaction when everything comes together and you are there to capture it. Only one hour of photography, yet my batteries were topped up for the whole week, and I was more than ready to lead the workshop without feeling anxious I may be missing opportunities.